Requirements • Must be located in China Mainland, South China area preferred • Good command of Chinese language, proficient with English speaking and writing • Able to follow established systems and learn quickly • Able to maintain professional external and internal relationships reflecting the company's core values • 2-5 years' sales experience • Experience with Microsoft Office products • Must be highly motivated and target-driven with a proven track record for meeting quotas • Good prioritizing, time management and organizational skills • Create and deliver proposals tailored to each prospect's needs • Experience in the electronics industry desirable Key Responsibilities include: • Sell advertising contracts for monthly magazine • Develop and cultivate new business • Keep timely and accurate records • Generate and follow up on all leads • Manage contract renewals • Account management: work with local and interna- tional team to provide customer support • Phone and email communications with prospects • Occasional travel Qualifications Successful candidates should possess a university degree or equivalent, experience with managing and cultivating leads, projecting, tracking and reporting revenue. 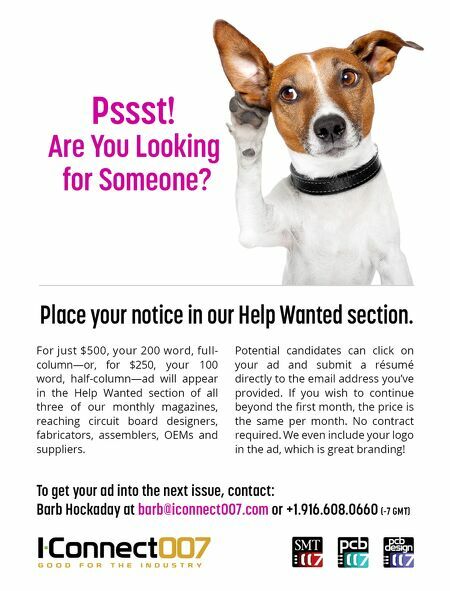 We are looking for positive, high-energy candidates who work well in a self-managed, team-based, virtual environment. Compensation This is a base salary-plus-commission position. Compensation commensurate with experience. Black: C: 60 M: 40 Y: 40 K:100 (print) Blue-Green: C: 70 M: 0 Y: 30 K: 0 Blue: C: 50 M: 0 Y: 15 K: 0 Green: C: 62 M: 0 Y: 10i0 K: 0 Yellow: C: 20 M: 40 Y: 100 K: 0 WEEKLY NEWSLETTER 每周通讯 W W W . I C O N N E C T 0 0 7 C H I N A . 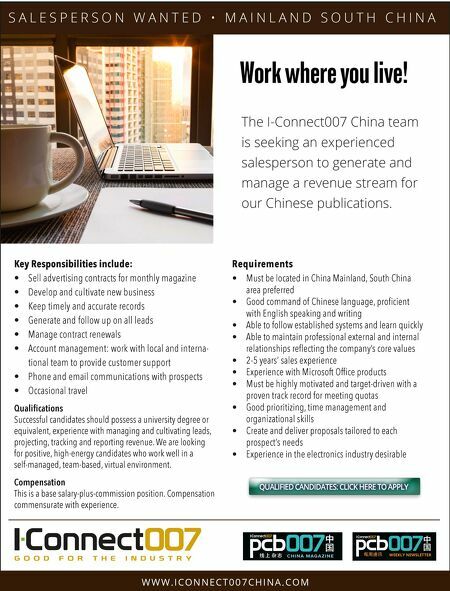 C O M The I-Connect007 China team is seeking an experienced salesperson to generate and manage a revenue stream for our Chinese publications.